The County-seat town of Media is like the menu at a great restaurant...spicy, on-trend, full-bodied and loaded with personality. 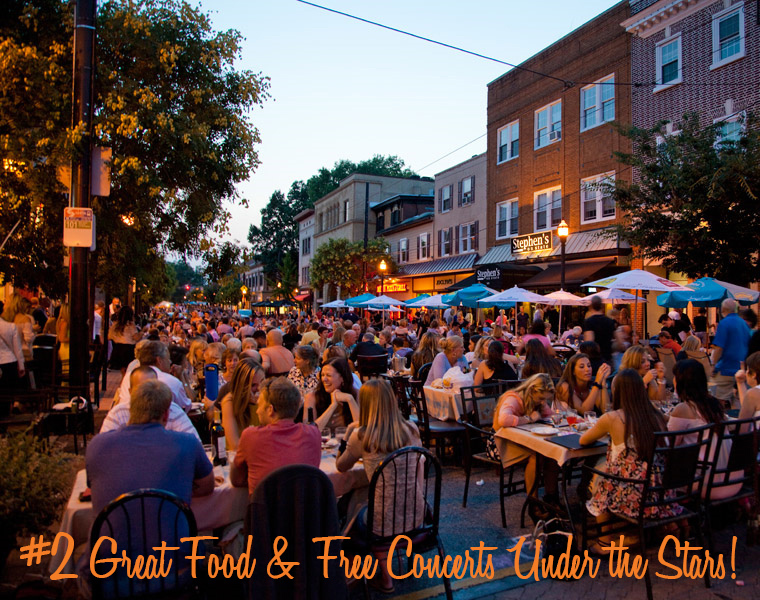 And every Wednesday through mid-September, 5 to 11pm, the chefs are Takin' it to the Streets! showcasing fabulous dishes as twilight falls and the streets shimmer. Fondly known as "everybody's hometown," its perfect for street browsing and shopping. You'll find dozens of independent shops and boutiques, flower shops, gift shops, cool coffee shops, juice bars almost two dozen globally inspired restaurants from Thai, to Italian, French, Mexican and that's just for starters! Also...just a few miles away, as twilight arrives at Media's Rose Tree Park...so do hundreds of people, carrying blankets and lawn chairs and babies and baskets of treats. They come for the free concerts, 5 of them every week from Wednesday through Sunday! If you're old enough to remember drive-in movies you'll find the same 'community atmosphere' as you hop out of the car with blankets and treats. 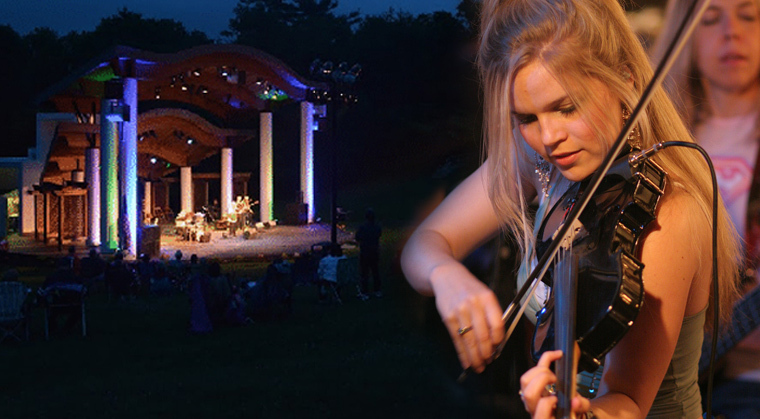 While you're picking your spot on the hillside above a state-of-the-art Amphitheater, the sound of musicians tuning up blends with kid's laughter -- and like magic, the stress of the day powers down. Before the show there's a steady hum as frisbees are tossed, and moms, dads and groups of friends gather on blankets and lawn chairs, all gabbing like they haven't seen each other in days. Neighbors stop by to say hello on their way to the food stand...and everybody gets to enjoy a giant slice of small town America in one of Philly's most bustling suburbs. Showtime is typically 7:30 pm, Wednesday through Sunday evenings - 10am for morning children's shows. the songs on The Robert Eric Band Playlist! 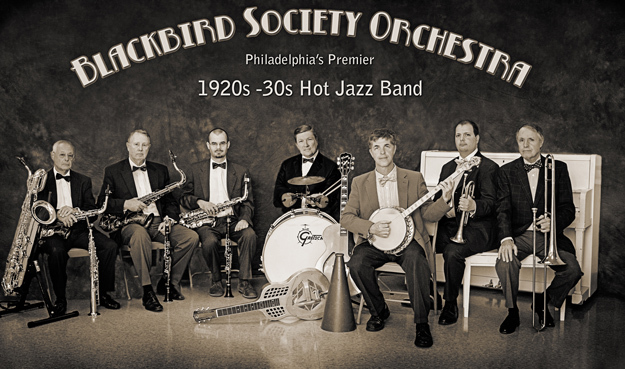 You're gonna love their sound - check them out on July 13th. National Blueberry Month is just another excuse to go berry crazy all over Delco! From Linvilla's famous Blueberry Festival to some of the berry best blueberry pancakes, waffles and pie you don't have to make at home - we'll all be going blue this month! 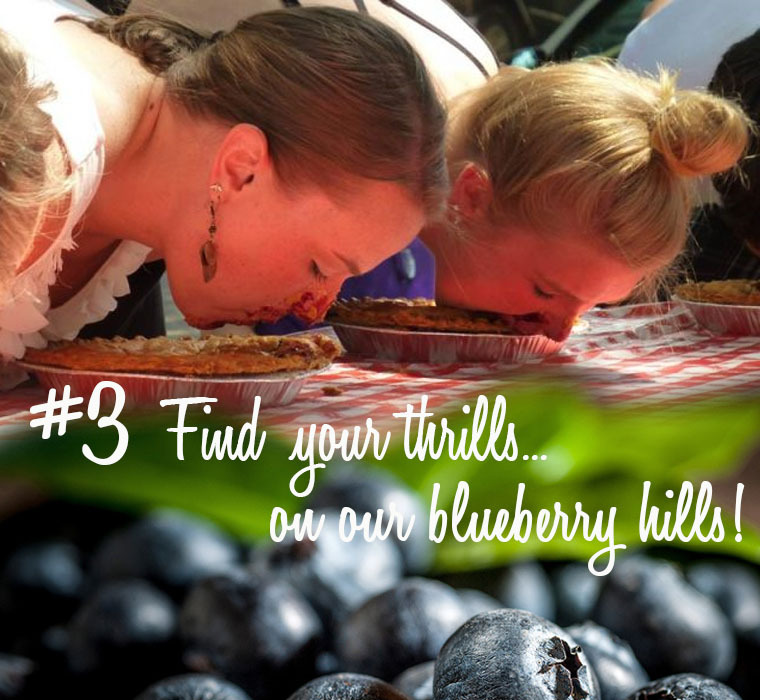 On July 8th Linvilla Orchards invites you to pick your own blueberries or scarf down as much their outrageously good fresh-baked blueberry pie as you can eat in 1 to 2 1/2 minutes at the pie-eating contest...either way you'll be in blueberry heaven! Berry picking starts at 8am. 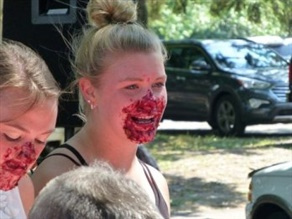 The famous blueberry pie eating contest kicks off at 2pm with several categories for all ages! The winners in each group get a prize so be sure to fill out a short entry form in person that day starting at noon. And the prize is a $25 gift certificate for each age bracket winner! Makin’ Music hosts an afternoon filled with games and activities of every kind! Meet Traveling Train, Dr. Duck, Spider Man, Captain America and their Little One-eyed Yellow Dude and grab an instrument cause everybody 'plays' at Linvilla. You can also practice your pitching at the Dunk Tank! 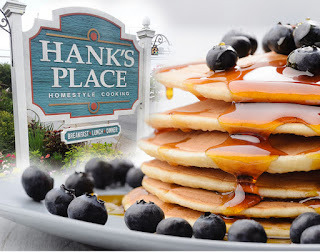 For over 16 years Hank’s place has been serving comfort food “where hungry people eat and friendly people meet.” An award winning favorite of celebrities, visitors and locals alike, Hank’s is open for early breakfast (many favorites served all day) as well as daily lunch and dinner. Local blueberries abound in their gourmet blueberry pancakes, gourmet blueberry French toast, and blueberry muffins, grilled or plain, and desserts,all baked right on the premises. at Minella's, when he comes to visit! 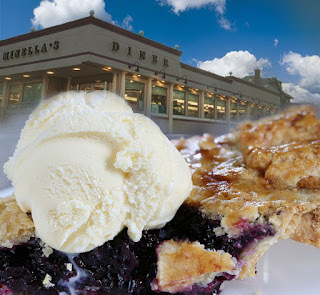 MINELLA'S DINER HAS KILLER BLUEBERRY PIE! 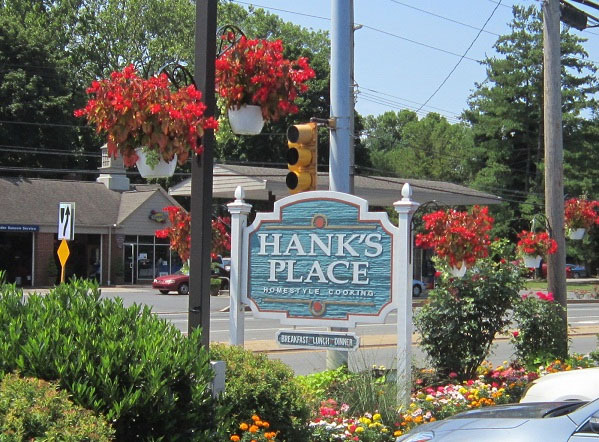 This classic 24/7 diner has been voted “best diner on the Main Line” for its comprehensive menus, on-premises bakery, full bar, and friendly service in an easy going, relaxed atmosphere. From their blueberry muffins to their blueberry pies – all truly home made and available for takeout – the freshest berries of the season will tempt you every time. 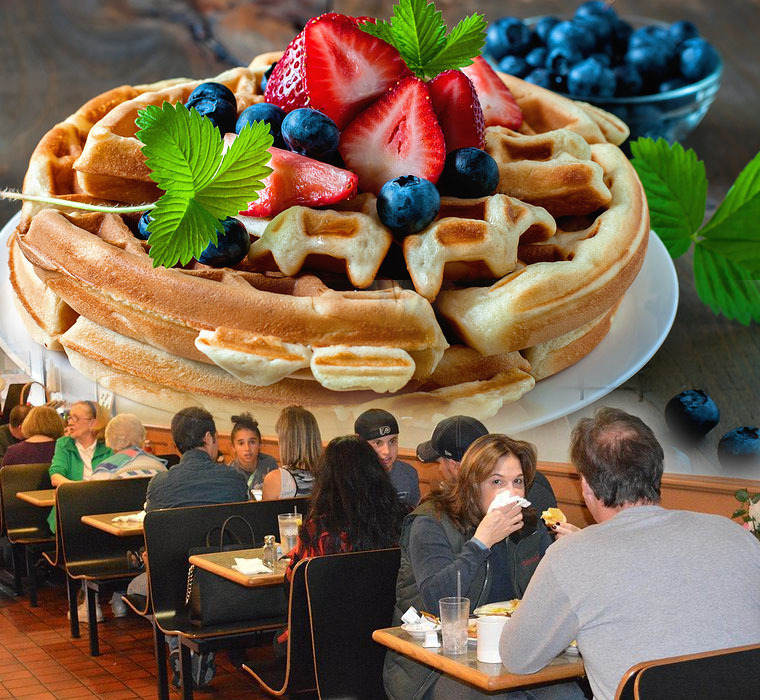 This popular gathering spot is open every day for breakfast and lunch, and for dinner Thursday, Friday and Saturday. Every dish is prepared to order, using only the freshest ingredients, and their mouthwatering blueberry pancakes, French Toast, and Belgian Waffles are practically bursting with locally grown berries. Want fresh blueberries? Click below! "Get your motor runnin'...head out on the highway.... lookin' for adventure...and whatever comes our way!" The Simeone Foundation Automotive Museum is one of the world’s greatest collections of racing sports cars -- and you'll see 65 of the most historically significant cars all under one roof! 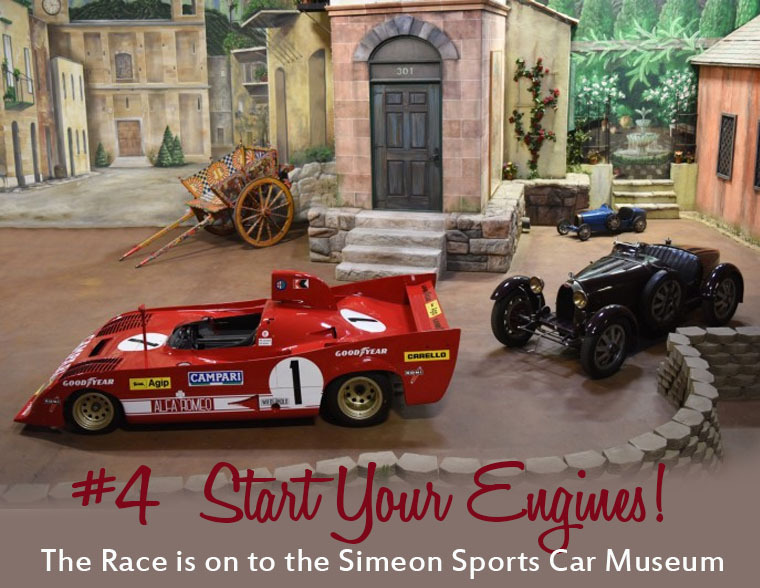 Assembled over 50 years by Dr. Frederick Simeone, the Museum features Ferrari, Alfa Romeo, Bugatti, Mercedes, Jaguar, Bentley, Porsche, Aston Martin, Corvette, Ford, and more. There are many different types of events including their world famous Demo Days. And they are also the only Philadelphia Museum with a 5-Star Yelp rating! Don't miss their new “Mopar or No Car” exhibit that celebrates the rich history of one of America’s oldest and greatest automotive manufacturers. Twelve cars will be on display, ranging from the early 1960s through today. They represent an exciting array of Mopar sports cars from Dodge, Chrysler, Plymouth, and SRT. Whether it was the Superbird on the high banks at Daytona, the Viper at Le Mans, or the Hemi at every local drag strip and stoplight in America, Mopars have always been tough to beat. While they enjoyed the majority of their success in the late 1960s and early 1970s, the Mopar brand has enjoyed a resurgence in recent years. They feature several retro-styled models offering “Hellcat” performance packages in excess of 700 horsepower as well as outrageous design graphics. The Blue Oval and the Bow Tie on the track and on the street! Featured Cars: Ford GT40 Mk II, Chevrolet Corvette Grand Sport, Boss Mustang, Corvette 427 Roadster, Bill Elliott NASCAR Ford Thunderbird. Plus a special guest car to be announced soon. Hours: Tuesday - Friday 10am to 6pm; Sat & Sun 10am to 4pm. Closed Monday. 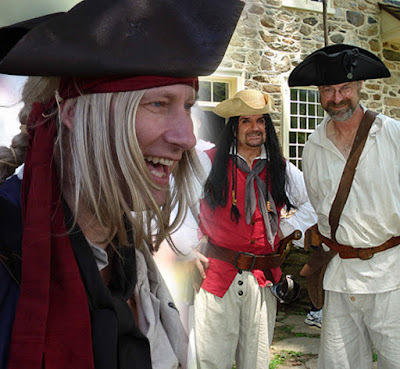 As was said so often in the Pirates of the Caribbean films, “Let’s Parley” on July 8th from 11am to 4pm at the Colonial Plantation, where pirates, spies and devilish rouges of the high seas drop anchor for a fun day of pirate battles and spy missions. When pirates fought, they had the right to call for ‘parley’ – a temporary truce followed by discussion and deal making – but the only thing you’ll be ‘negotiating’ on Saturday is your way around the plantation with swashbuckling games, water battles, plus pirate flag-making. Pirate ship flags were like today’s business cards, announcing the name and reputation of the ship. If a trading vessel neared a ship flying Blackbeard’s flag, it often surrendered right away because of the fearsome fighting reputation of the captain and crew. So come make your own flag and let it fly while learning more about our Delaware River’s nefarious pirate history. 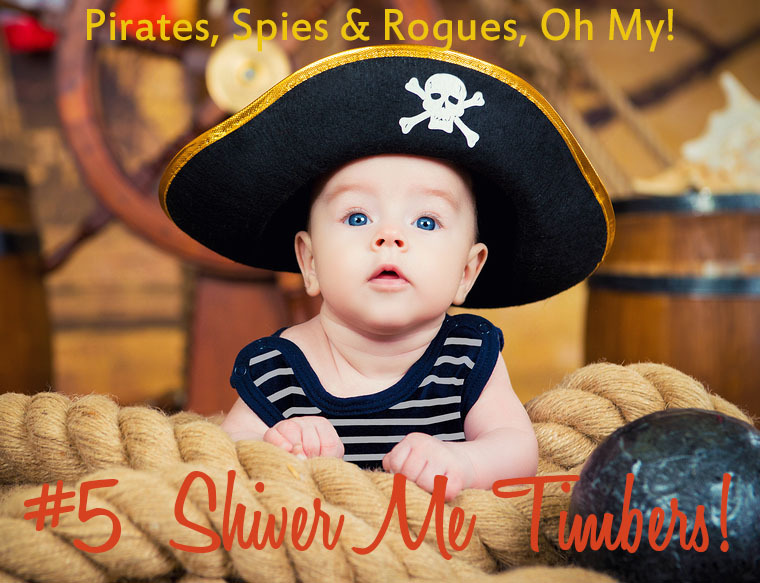 Read about our local Blackbeard connection! Click below to read about the infamous “Plank House”in Marcus Hook, a haven for pirates in the early 19th century. Three months ago the Plank House was inducted into The National Historic Register -- the official Federal list of districts, sites, building, structures and objects significant in American history, architecture, archeology, engineering and culture. Admission: $10 for adults; $6 for children ages 4 to 12: Children under age 4 are free. To GPS the location: 3900 North Sandy Flash Drive, Newtown Square, PA 19073. We're taking you Canoeing & Tubing -- Hiking, Biking & Birding -- and Fishing for your dinner! 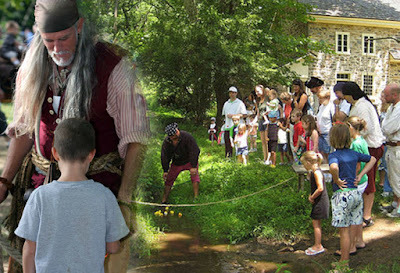 Here are a few places to role play Daniel Boone, paddling down a Pennsylvania River! 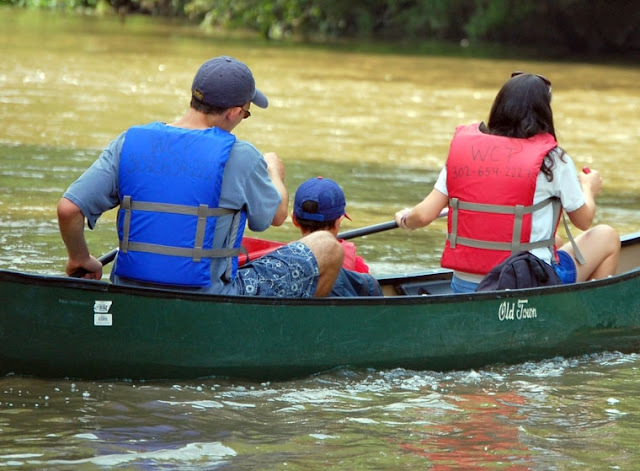 Northbrook is a family run canoe company that has been providing memorable trips down the scenic Brandywine Creek for 40 years! Paddling is part of all modes of transportation, from canoes and kayaks to bright orange tubes for a lazier glide... Chlorine saturated pools are everywhere, but there's nothing like the ride you take with mother nature all around you! A perfect summer escape for families, and groups large and small. 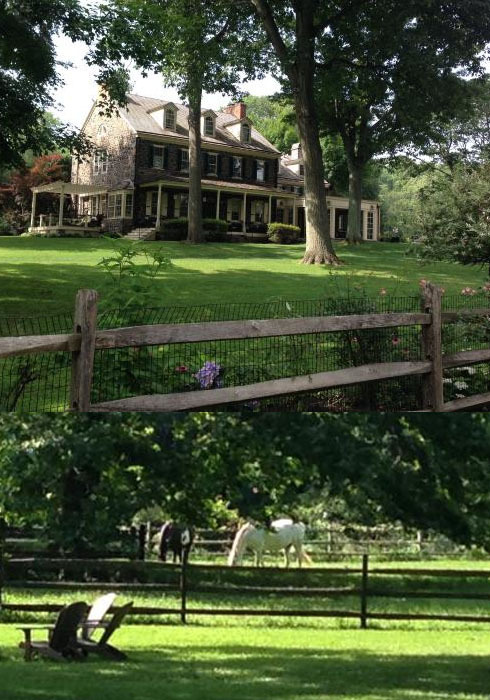 Choose a short relaxing trip or a full day adventure on the Historic and Scenic Brandywine River. For pricing, tips and registration visit the website below. 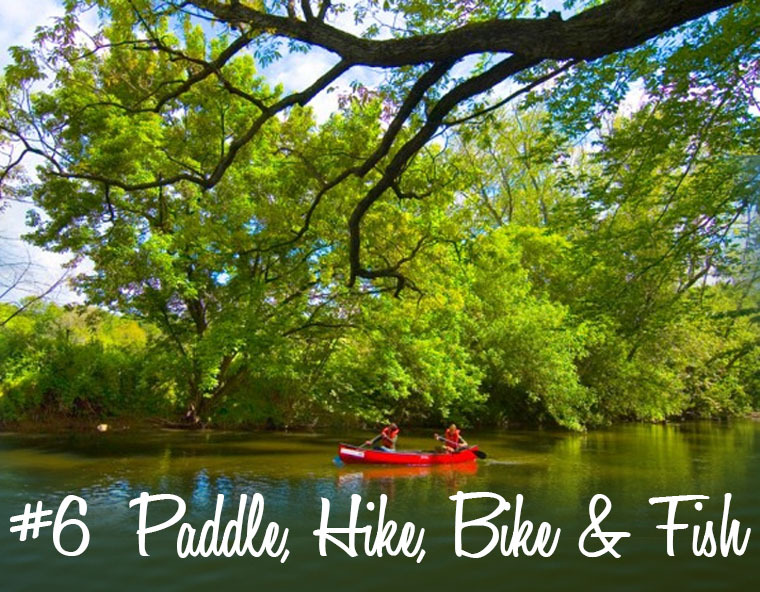 Get ready for some of the finest family paddling in Delaware and southeastern Pennsylvania! 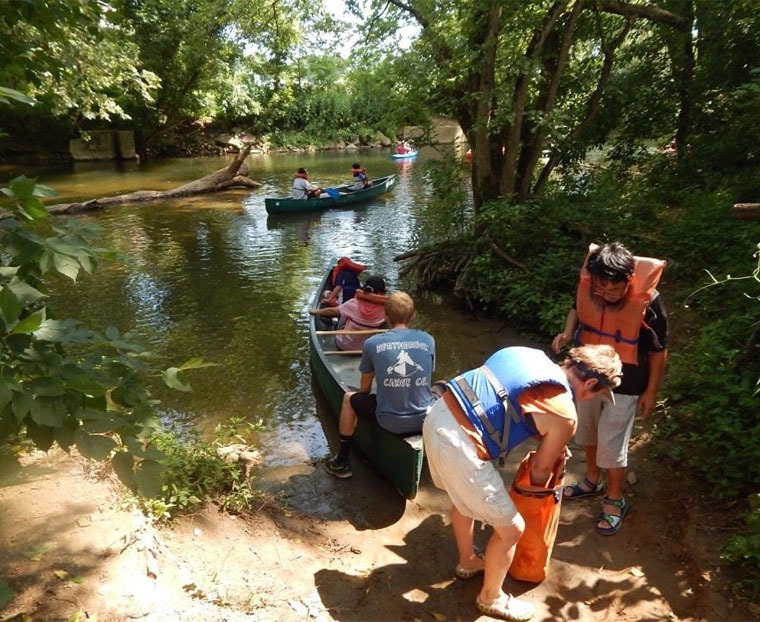 The Brandywine River is excellent for first-timers or group trips because of it’s meandering and gentle flow. 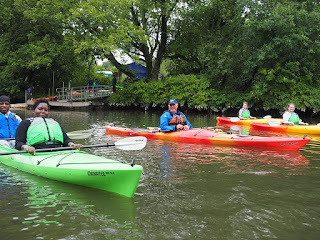 It can also be one of the most relaxing, healthy, and enjoyable ways to spend a few hours or a full day on the water surrounded by lush greenery and history of the Brandywine Valley. The company is a complete canoe and kayak outfitter, offering canoes, solo or tandem kayaks, and tube trips, plus paddles, life jackets, and transportation to and from the river, safety equipment and advice. All you need to do is pick a date, time and distance. 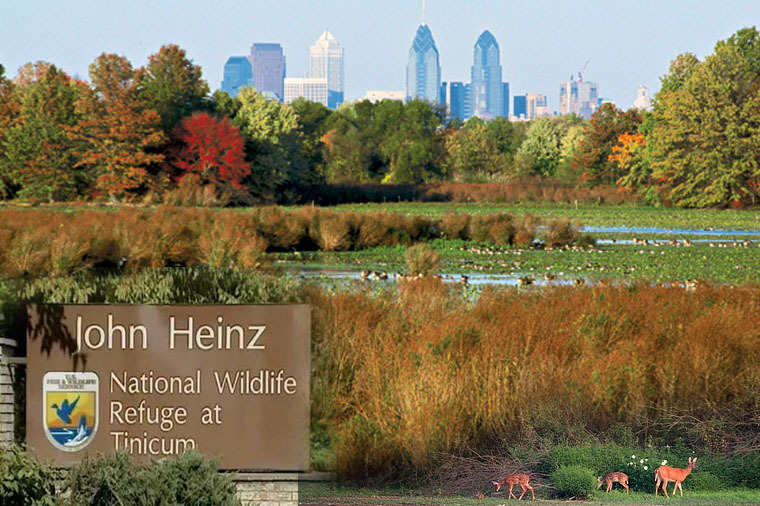 The 4.5 mile segment of Darby Creek that flows through the Refuge at Tinicum is unique and scenic. It winds through the largest freshwater marsh in Pennsylvania, which allows canoeists to see a variety of plants and animals. The refuge waters are tidal and navigable only within 2 hours before and after high tide. Along the creek, you may see the eastern painted turtle or the state-endangered red-bellied turtle sunning on a log or rock. Hooded mergansers, pintails, shovelers and mallards are a few of the ducks that you may pass. Least bitterns, great egrets, black-crowned night herons and yellow warblers are among the species which nest on or near the refuge. And Muskrats, opossum, deer and raccoons are present as well, though some may be more readily seen at night. This place is also totally for the birds! So bring your binoculars and see how many different species you can find! The refuge protects a variety of habitats for birds in the highly urbanized landscape of greater Philadelphia and has been designated as an Important Bird Area by the National Audubon Society. While most of the 300 plus avian species identified at the refuge utilize it as a migratory stopover, more than 80 species have been recorded nesting on the refuge over the years. Several species are also state listed as either threatened or endangered species or species of state or national management concern. And here are a few slices of heaven for Hikers, Bikers & Fishers of Dinner! Ridley Creek State Park is 2,606 Acres of OMG! Mother Nature laid out a gorgeous green carpet in these Delaware County woodlands and meadows. The gently rolling terrain of the park, bisected by Ridley Creek, is only 16 miles from center city Philadelphia and is an oasis of open space in a growing urban area. It is also home to the Colonial Pennsylvania Plantation, one of the oldest working plantations in PA and a fun place to visit. 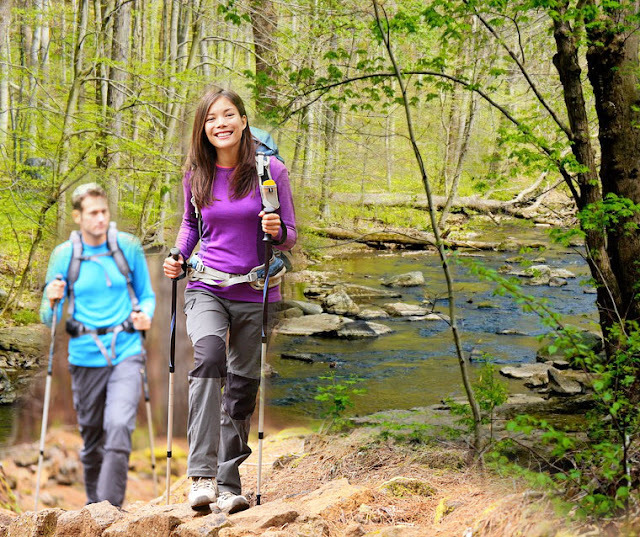 Hikers will find 13 miles of trails passing through a variety of habitats throughout the central portion of the park. 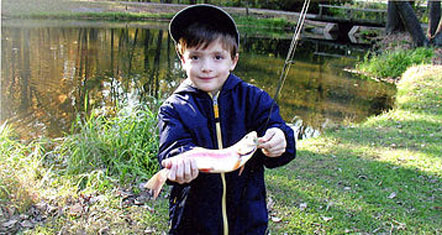 Fishermen leave happy at Ridley Creek because it's stocked with trout and provides excellent angling opportunities. The portion of the creek from Sycamore Mills Dam to the mouth of Dismal Run is a catch and release, fly fishing only area. An ADA accessible fishing platform is on the paved, Multi-Use Trail along Sycamore Mills Road Trail. Bikers really like the 4.6 mile multi-use paved trail at Ridley Creek which features 5 miles of trails along Sycamore Mills Road and Forge Road. These trails are designated for bicycles, joggers, walkers, and cross-country skiers. The multi-use trail begins at the intersection of Barren Road and Chapel Hill Road. 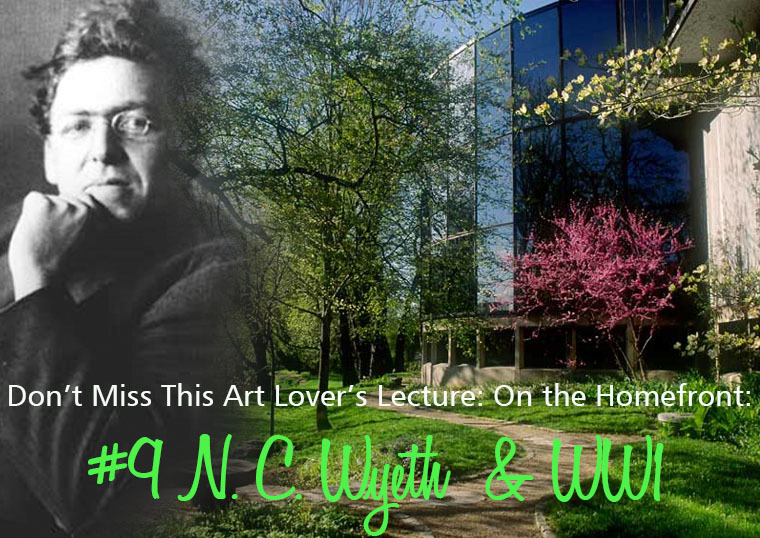 E. Mortimer Newlin, founder of the Nicholas Newlin Foundation, was an enthusiastic fly fisherman who immediately recognized the possibilities of the trout stream – the West Branch of the Chester Creek – that runs through the property. Trout fishing has become a well-loved and enjoyable feature of the park.Both pond and stream fishing are available from the opening of the Delaware County trout fishing season through October, conditions permitting. 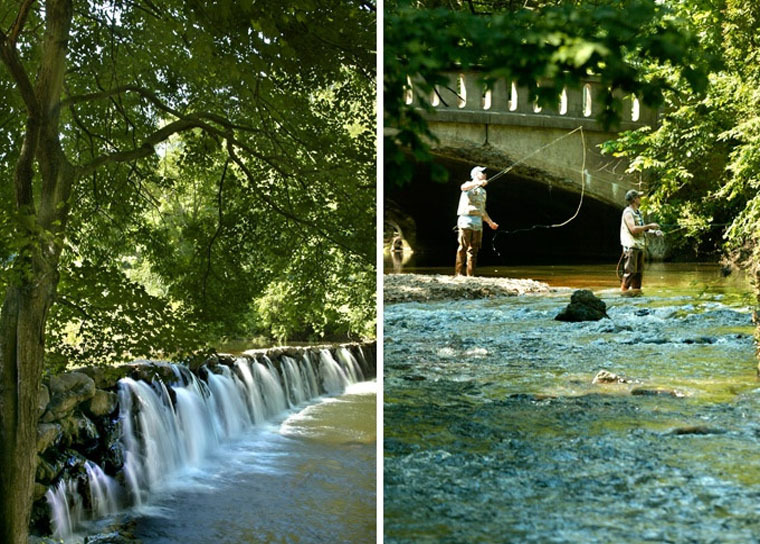 The stream is reserved for the use of fly fishing members for a seasonal fee. Stream fishing is open every day from the opening of the Delaware County, trout fishing season to October 31st. To fish the stream, members and guests need both a Pennsylvania fishing license and a Newlin Grist Mill fly fishing membership. E-mail them at info@newlingristmill.org to request that membership information be mailed to you. 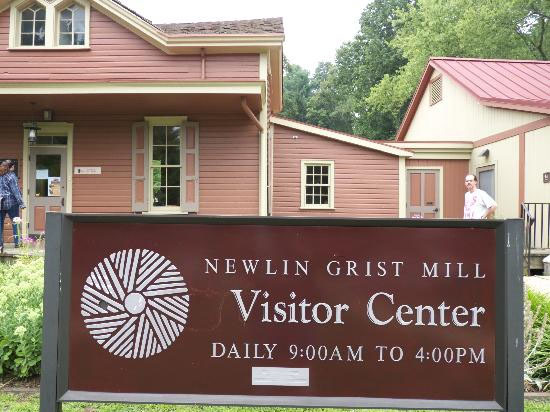 The Newlin Grist Mill and the surrounding 160-acre park is a place for exploration of both history and the environment. 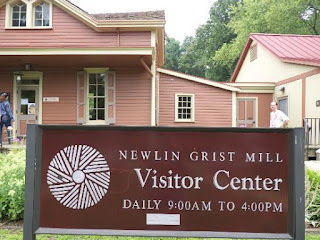 With its working grist mill, programs, and nature trails, the Newlin Grist Mill is where Learning Is Fun! Whether you are involved in preservation, education, outdoor recreation, or just relaxing, there is something for you. Summer's in full swing - and so should you be! 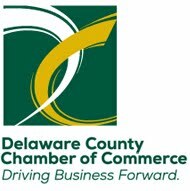 Amazing private and public golf courses are calling out your name...and Delco is also at the heart of the region’s most beautiful gardens! 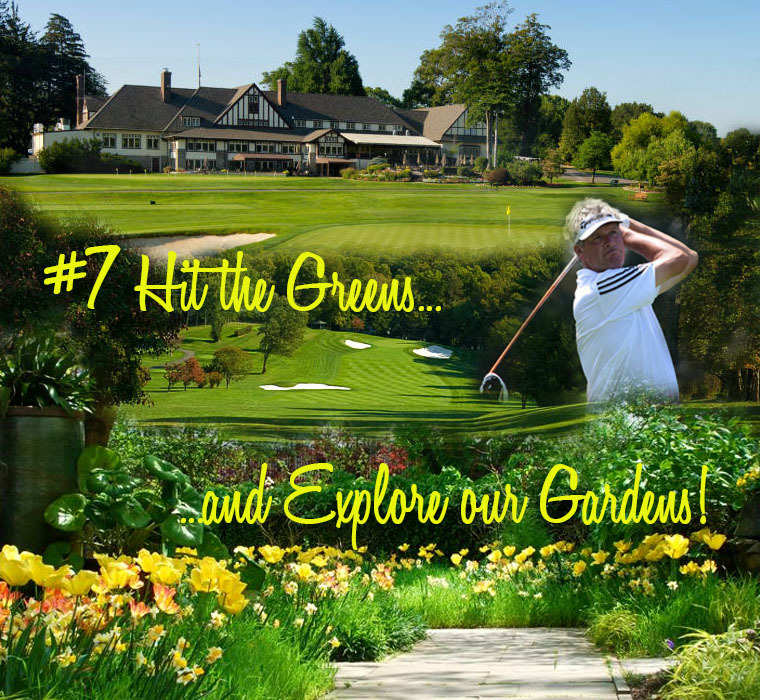 Read about all of them in our Gardens & Greens Tour Guide. Springfield Country Club is located in Central Delaware County. Spend a relaxing day on the greens of Springfield Country Club’s 18-hole public golf course featuring challenging and beautifully landscaped fairways (6018 yard, par 70)! Guests can also enjoy overnight accommodations at our onsite Courtyard by Marriott hotel featuring new luxury guests suites, enjoy cocktails and a bite to eat at Tavola Restaurant + Bar, and get pampered at the new Joseph Anthony Retreat Spa and Dry Bar. Plus, we are just minutes from local shopping and Downtown Philadelphia. 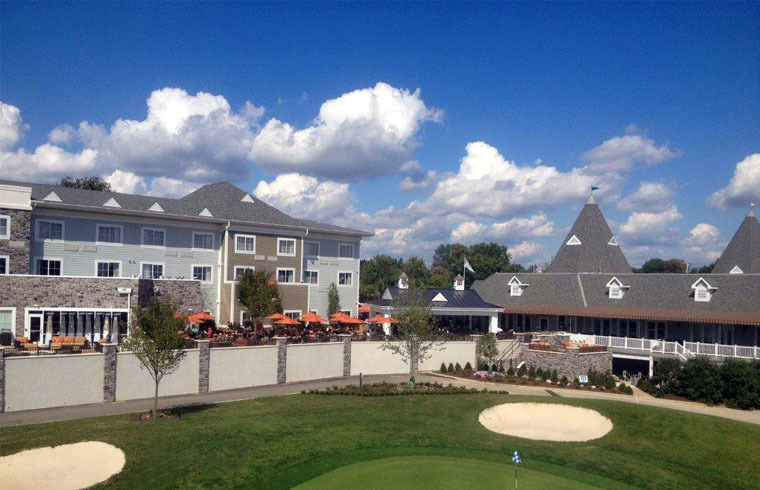 The Award Winning Golf Course at Glen Mills is a public course located in historic Thornbury Township. It is the only golf course in the Philadelphia area featuring 12-minute starting times. It is a full service, 18-hole golf facility including multiple manicured practice areas. For over a decade this Bobby Weed design has been providing the daily fee golfer with superior golf and the natural beauty of Glen Mills. Penn Oaks Golf Course provides amazing scenery and breathtaking views that hearken back to the pre-Colonial era when King Charles II first bestowed this parcel of land to William Penn. From the moment you step out of your car, there's a feeling of 'stepping back in time'...maybe its the terrain, or the giant oak trees or the lush hills, or the way the lakes seem carved into the land...but you can almost feel the age and history of this place wash over you. Grand pines line the rolling hillsides of the course’s narrow layout, making it challenging even for many pros. There's plenty of adventure (and potential disaster ;) to be found on this 18-hole golf course, as well...including Bubba-long holes daring you to get your ball to the green! There's over 1000 acres of gorgeousness at Longwood Gardens. Longwood Gardens is an American botanical garden consisting of over 1,077 acres of gardens, woodlands, and meadows in our Brandywine Valley. It is one of the premier horticultural display gardens in the United States and is open to visitors year-round to enjoy exotic plants and horticulture, events and performances, seasonal and themed attractions, as well as educational lectures, courses, and workshops. Nemours Mansion and Gardens is an unforgettable experience! 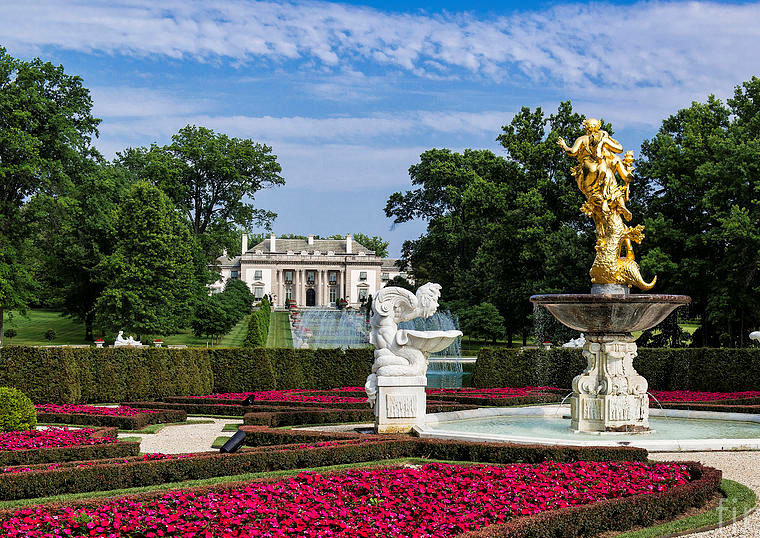 Nemours Mansion and Gardens is a 300-acre country estate with jardin à la française formal gardens and a classical French mansion in Wilmington, Delaware. Built to resemble a château, it has 105 rooms on five floors, occupying nearly 47,000 sq ft. It shares the grounds with the Alfred I. duPont Hospital for Children, and is part of the huge DuPont legacy. The mansion contains rare French 18th-century furniture and an eclectic collection of notable antiques, works of art, and tapestries. Artworks range from 16th-century religious works to paintings by European masters to early works by Americans Frederic Remington and Sidney Lawrence. A rare Louis XVI musical clock, circa 1785, by David Roentgen and Peter Kinzing, plays four tunes on a dulcimer and pipe organ. ornamental plants, trees, shrubs, vines and perennials. The Scott Arboretum is a unique garden of ideas and suggestions encouraging horticulture in its broadest senses through displays on the 350-plus acre campus of Swarthmore College. It offers some of the region’s most intimate, authentic, and accessible horticultural experiences, and is frequently ranked among the most beautiful campuses in the world. Don't miss this outstanding production that illustrates the famous line " Anything one man can imagine, other men can make real!" 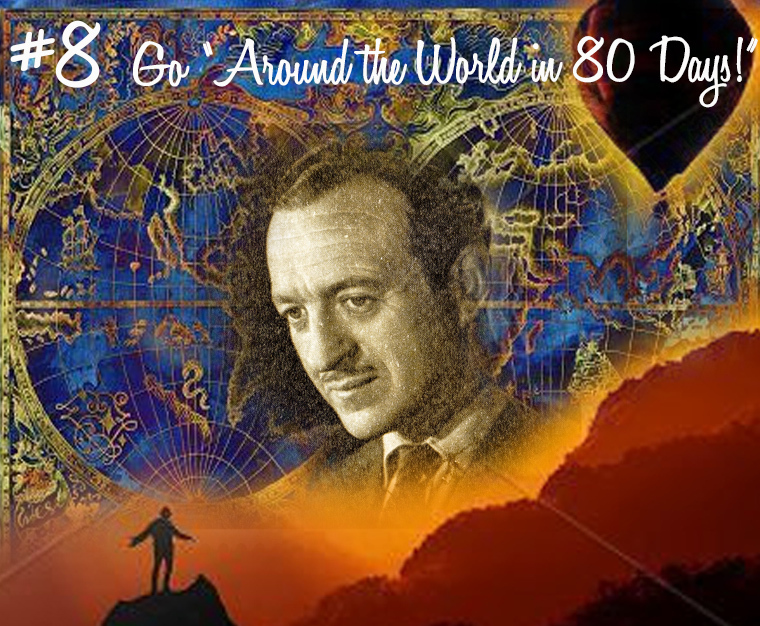 Set in 1890 the plot revolves around Phileas Fogg, who agrees to an outrageous wager to circumnavigate the globe in 80 days. The wager puts his fortune and his life at risk. But his every step is dogged by a detective who thinks he’s a bank robber on the run. This is a whirlwind of a show as five actors portray 39 characters in a race around the world in 80 days. Cool note: Phileas has been played by many actors over the years, from David Niven in 1956 (pictured above) to Pierce Brosnan, who famously portrayed another headstrong character...OO7! 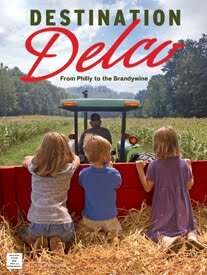 Whether you're local or one of the millions of visitors who come to Delco every year, this is a day-long Wyeth-loving - Battle Ready - High Flying - Bloomin' Adventure for the whole family! 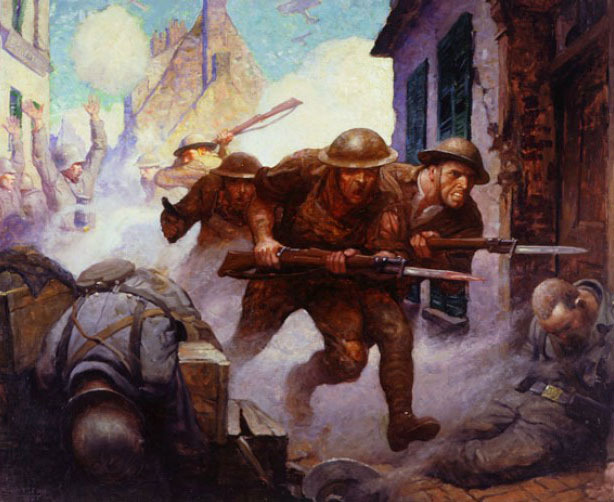 N. C. Wyeth contributed to the war effort from his studio in Chadds Ford and the lecture surveys the body of his war-themed work, and particularly examines how he kept his images vital and relevant, despite his lack of firsthand battlefield experience. 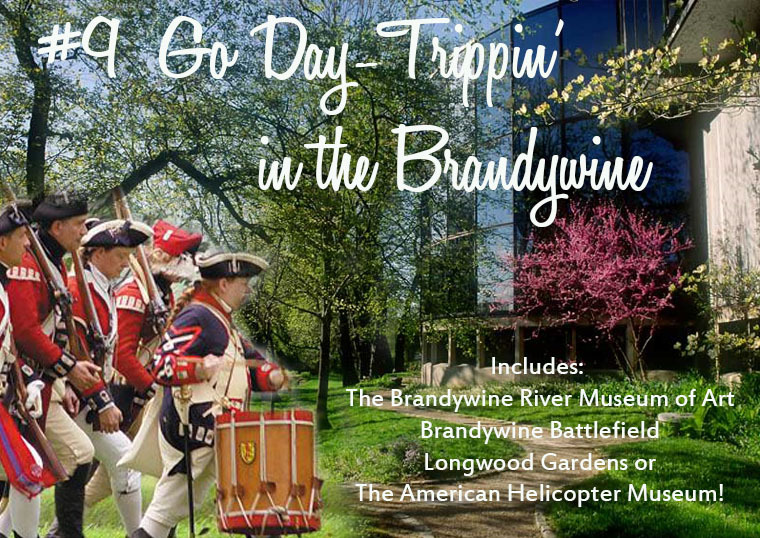 The Battlefield is part of the site of the Battle of Brandywine fought on September 11, 1777, during the American Revolution. It was the largest land battle of the American Revolution, covering more than ten square miles, or 35,000 acres. The Park served primarily as the Continental encampment for the two days prior to the battle. 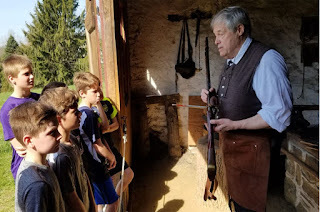 There are daily tours of Washington’s Headquarters, a twenty minute film on the battle, and a lot of interesting artifacts to see at the museum. Hours now through Sept 11th: Tues - Sat 9 AM to 4 PM; Sunday noon to 4 PM. Closed Monday. Open Fourth of July and Labor Day Sept 4. The park is free to walk around and use. There are outdoor picnic areas. Restrooms are located in the Visitor’s Center (open til 4PM). No fires permitted on the grounds. 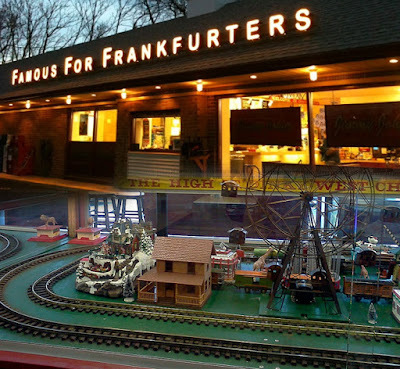 Between the Battlefield and the Helicopter Museum, Jimmy John's is famous for its Electric Trains and its Frankfurters! 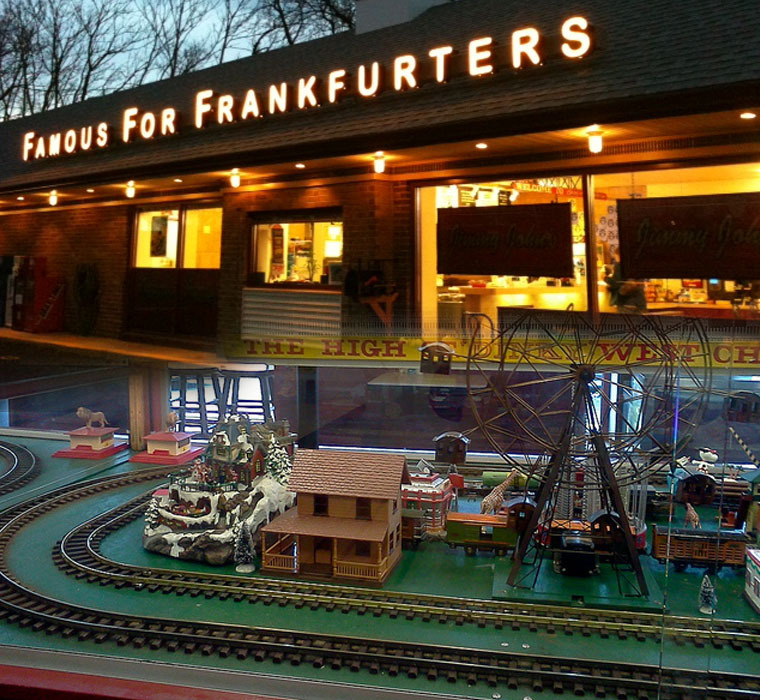 You'll find great pricing, a kid-lovin' menu and amazing Electric trains that chug along the ceiling. Serves 100,000+ hot dogs a year, plus great hot sausage, burgers, cheesesteaks, pulled-pork BBQ sandwiches, grilled chicken filet and their famous Sloppy Joes! Home-style cooking: breakfast, lunch and dinner! This newly remodeled restaurant has been in business for 16+ years because it perfectly blends rustic charm and top notch home-style cooking. Everything is made fresh right on the premises! 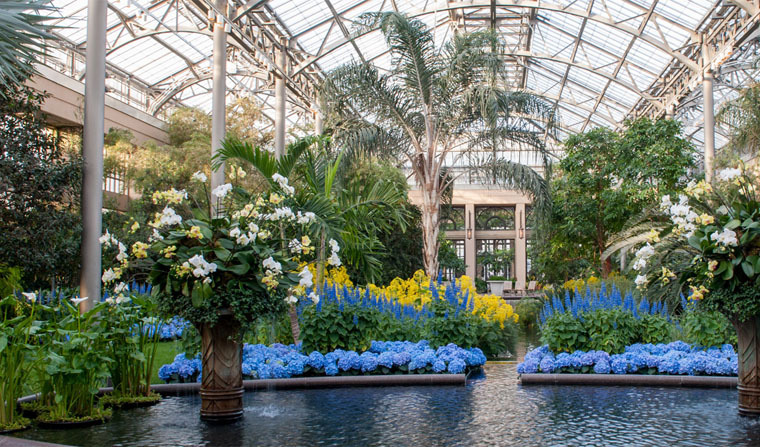 Longwood Gardens is an American botanical garden at the heart of what has been called "The Garden Capital of the Nation." There are more than 30 gardens within 30 miles...and this one is a beauty! Longwood consists of over 1,077 acres of gardens, woodlands, and meadows in the Brandywine Valley. It is one of the premier horticultural display gardens in the United States and is open to visitors year-round to enjoy exotic plants and horticulture, events and performances, seasonal and themed attractions, as well as educational lectures, courses, and workshops. The ZOOM! comes at one of the nation's few Helicopter Museums - and this one is also an education center with lots of hands-on fun for children and adults, alike! Check out 40+ helicopters including a medical helo like the ones featured in the M.A.S.H. TV program. This Museum focuses on the history, science and technology of rotary wing aviation. The collection contains both civilian and military autogyros, convertiplanes and helicopters, including some early generation models. 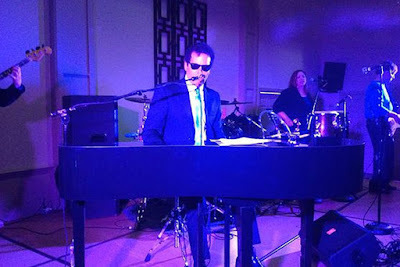 'Dine With Grace' from 6:30 to 9:30pm, as part of the vineyard's "Grace supper series." Enjoy a farm to table dinner experience prepared by Executive Chef Scott Megill in collaboration with local area Chefs. The historic farm and vineyard provide a breathtaking backdrop for a truly unique dining experience. 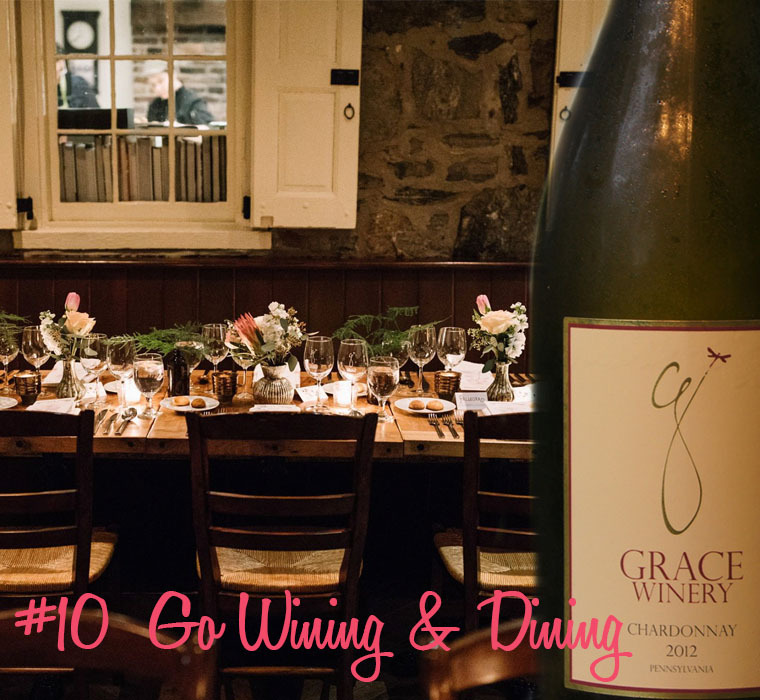 For questions or dietary issues please email Rachel at events@gracewinery.com or call (610)-459-4711.